European Central Bank president Mario Draghi said ECB officials are unanimous in their commitment to unleash more monetary stimulus if needed. The euro is plunging on the news. In recent months, economic conditions have deteriorated substantially in the eurozone with growth slowing and prices sliding. Economists have been expecting more easy monetary policy to come. However, it appears the currency markets wern’t expecting Draghi and the ECB to be quite so dovish in their language today. All of this comes as economic data improves in the US. Last week, the Federal Reserve announced the end of quantitative easing, a monetary stimulus program involving the purchases of Treasury and mortgage bonds. The Fed has also been prepping everyone for tighter monetary policy via interest rate hikes some time next year. Tighter policy from the Fed is bullish for the US dollar while looser policy from the ECB is bearish for the euro. 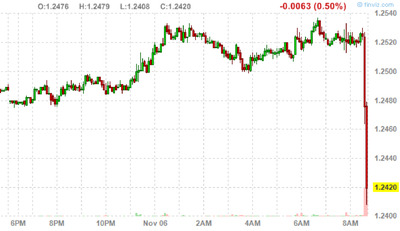 So, it’s no surprise to see the euro plunging against the dollar today. Here’s a chart of the euro against the dollar via FinViz.com. FinVizHere’s a look at the euro against the dollar.